Gettin' Dirty with the Derksemas: SOUND OFF! Not too forward at all! It isn't your job to keep them employed, I can't believe they try and guilt you like that! Thankfully, I don't get any solicitors.. (knock wood) just the occasional guys on bikes with white shirts and black ties... but I don't open the door. Just pretend I'm not home, even if it's really clear that SOMEONE is in there.... lol. I have done my share of holding my breath at the peephole! 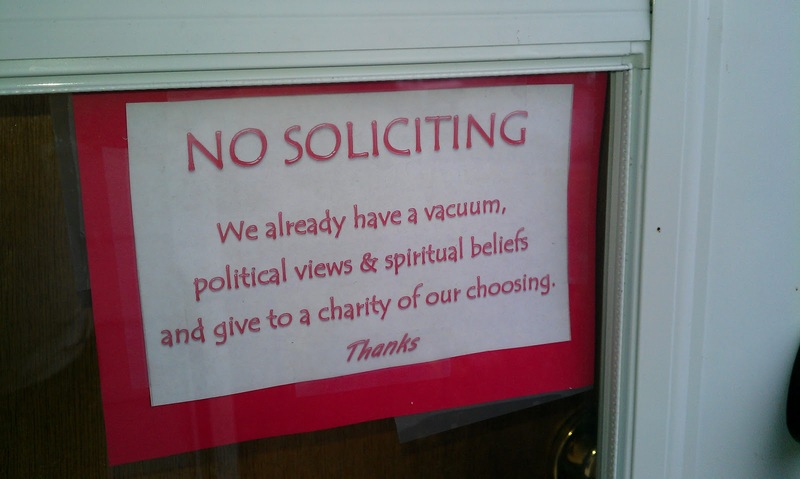 I guess that is the best way to do it- just don't answer the door... but I alway instantly regret it simply because I start wondering "Was that one of my neighbors who needed something?" Or someone I knew but didn't recognize or something to that effect. Damned if you do, damned if you don't! 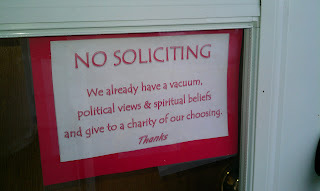 We have a no soliciting sign and it doesn't seem to matter... and it's always during nap time. The door bell rings, big, loud, overgrown guard dogs bark and I hold my breath and pray they didn't wake the baby up. I go set person at door straight.